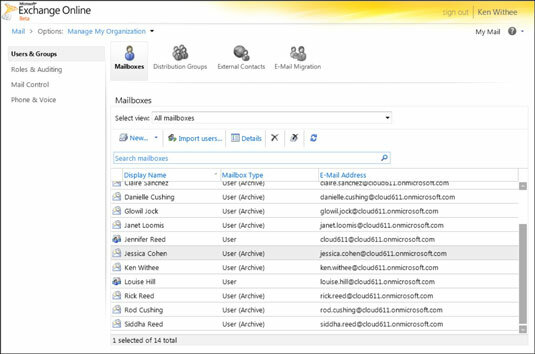 Exchange Online from Office 365 offers a simplified and intuitive administrative interface. You no longer need extraordinary expertise to get the very most out of the Exchange Product. Microsoft handles all the heavy lifting and provides an interface that allows even people with minimal technology skills to administer the company e-mail system by using nothing more than their web browser. If you have ever spent time talking with someone who is responsible for configuring Exchange Server, you know that it is not for the faint of heart. In fact, many people are so specialized that their entire careers are spent doing nothing but administering the Exchange Server software. If your organization is lucky enough to employ a full-time team of these rock-star administrators, then you have probably not experienced any major e-mail issues. Everything works as expected and nobody really cares why. The problem, however, is that if one critical person leaves the organization, you might not be as lucky with the replacement. The Exchange Online control panel is shown here.